the office. These convenient compartments are great at preventing clutter, but tend to be easily overlooked when it comes time for spring-cleaning. Organizing drawers and boxes can be one of the most entertaining clean-up tasks and sometimes even the most profitable. Most of us find things we thought were lost or just completely forgotten about, including letters, collectibles and a mix of priceless and valuable old jewelry. Sometimes it’s difficult to differentiate between costume and jewelers’ jewelry, so think twice before throwing it away. 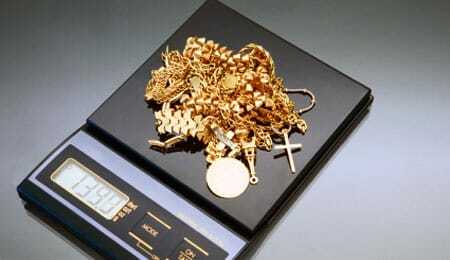 If you happen to find broken, scrap, unwanted or antique gold jewelry, you may have found a very valuable asset. Today’s gold prices are at an all time high and are predicted to continue climbing as the U.S. dollar and the Euro fluctuate in value. Before you head out to sell gold for cash, you will want to do a bit of homework first and keep in mind that the typical scrap gold buyer and traditional pawnshops will seldom offer fair value for gold, or any other asset for that matter. The average pawnbroker who buys gold will suggest you sell gold jewelry, coins and gold scrap pieces for less than what the assets are truly worth. Chapes JPL in Atlanta, Georgia will buy gold jewelry, gold scraps and mint gold coins at some of the highest values in the gold buying industry. We opened our doors more than 30 years ago for the very purpose of providing a better fast cash alternative for decent people who are experiencing financial hardship, or simply need money fast and don’t have time to wait on conventional banks. Not only do we offer more money for gold, but we also perform all gold appraisals in private at our luxurious offices, which are situated in financial buildings in some of the best parts of town. Although Chapes will buy scrap gold and fine jewelry outright, we encourage our clients to use their assets as collateral for a loan verses selling because gold, silver, platinum, diamonds and many gemstones will provide leverage for additional loans in the future. To learn more about selling scrap gold or other fine assets, chat with us online, submit a quote request, or call us on the phone to schedule your FREE appraisal. If you live outside the Atlanta area, speak with a Chapes representative about fuel reimbursement terms when doing business with us.